Last year, news broke that MusicfestNW was somewhat merging, somewhat absorbing one of the newest fest's to hit the PNW, Project Pabst. With skepticism concert goers awaited for the new superfest to announce its lineup and now that the fest is here, they're proving a fruitful merger by selling out their weekend pass tickets and individual tickets for Sunday. Headlining Project Pabst will be Ice Cube and Duran Duran on Saturday and Ween and Tame Impala on Sunday, so of course it makes sense why Sunday's bill is sold out. Since the reuniting of Ween last year, their sporadic playing of shows has fans devouring tickets like crazy. Festivities for PP technically started last night with a comedy show at Dante's featuring Toddy Barry, Bryan Cook and Joann Schinderle, and with hip hop mainstays Digable Planets and Camp Lo at the Crystal Ballroom. Local, more underground artists seem to be dominating the Project Pabst night shows (with the exception of Kyle Craft, who is blowing up and will be opening up the weekend fest tomorrow at 1 p.m.! ), with Y La Bamba, Orquestra Pacifico Tropical, Haley Heynderickx, Candace and Talkative all playing tonight. Zirakzigil, Muscle and Marrow, And And And, Souvenir Driver, Rilla, Grand Lake Islands, and Summer Cannibals all play tomorrow night, with Last Artful, Dodgr and My Body opening up for Shy Girls Sunday. 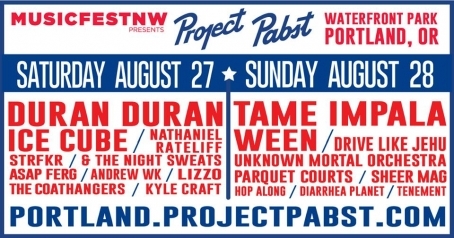 Make note of the fact that Project Pabst's weekend day shows are no longer at their usual Zidell Yards, but are now held at MusicfestNW's location of the Tom McCall Waterfront Park. Tickets to the weekend shows (minus individual ones for Saturday) are sold out, but ticket purchase for PP night shows are still available. To find the Project Pabst schedule, purchase Saturday tickets and to find out just where and when the Project Pabst night shows are, visit the festival's website.